Following the events of The Last Colony, John Scalzi tells the story of the fight to maintain the unity of the human race. The people of Earth now know that the human Colonial Union has kept them ignorant of the dangerous universe around them. For generations the CU had defended humanity against hostile aliens, deliberately keeping Earth an ignorant backwater and a source of military recruits. Now the CU's secrets are known to all. Other alien races have come on the scene and formed a new alliance—an alliance against the Colonial Union. And they've invited the people of Earth to join them. For a shaken and betrayed Earth, the choice isn't obvious or easy. Against such possibilities, managing the survival of the Colonial Union won't be easy, either. It will take diplomatic finesse, political cunning…and a brilliant "B Team," centered on the resourceful Lieutenant Harry Wilson, that can be deployed to deal with the unpredictable and unexpected things the universe throws at you when you're struggling to preserve the unity of the human race. Being published online from January to April 2013 as a three-month digital serial, The Human Division will appear as a full-length novel of the Old Man's War universe, plus—for the first time in print—the first tale of Lieutenant Harry Wilson, and a coda that wasn't part of the digital serialization. 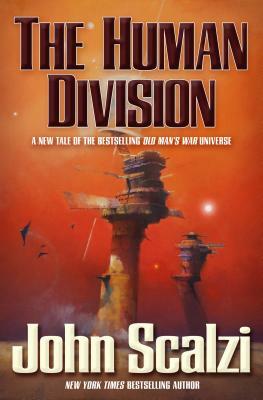 John Scalzi won the 2006 John W. Campbell Award for Best New Writer, the 2013 Hugo Award for Best Novel for Redshirts, and his debut novel Old Man’s War was a finalist for Hugo Award as well. His other books include The Ghost Brigades, The Android’s Dream, The Last Colony and The Human Division. He has won the Romantic Times Reviewers Choice Award for science-fiction, the Seiun, The Kurd Lasswitz and the Geffen awards. His weblog, The Whatever, is one of the most widely-read web sites in modern SF. Born and raised in California, Scalzi studied at the University of Chicago. He lives in southern Ohio with his wife and daughter.